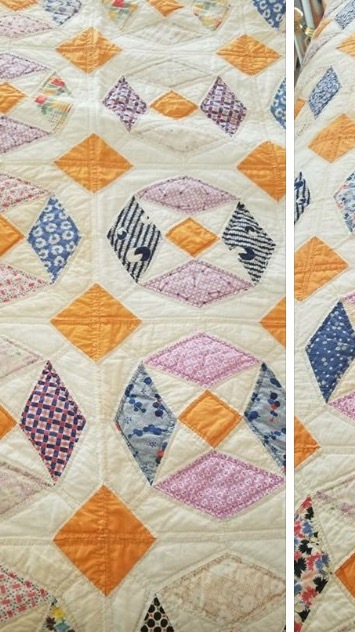 What quilt block is this? Thread: What quilt block is this? Sew many Quilts.......so little time! I haven't seen that one before. I hope someone comes up with the name. No name for you but it is a wonderful pattern. I like the way the four- pointed star is repeated as a large and small feature. Hope someone comes up with a name. In the EQ add on, Block Base by Barbara Brackman, it is labeled as Block #3947 OCS/Wheeler. I Googled it online and couldn't find any other name for it. Thanks Barb, for helping me. I hoped there would be a pattern out there somewhere.....will check out what you've found. You could go to Barbara Brackman’s blog and ask her. It may be in one of her books. Looks like the Storm at Sea quilt to me. One of my students is working on one now in Blue and teal with a white background. I am trying to "see" the seams to figure out the real block. it may not be where the quilting "seams" are. interesting. It's beautiful... and no doubt hand pieced. Wish I could help with a name but I've never seen it before now. Thanks everyone. My first thought was Storm At Sea also but it's different. And Ube, I didn't even notice the second star before. My sister found one in Dear Jane, think it was called Wildfire or Fireflower.....it may be adaptable. I was looking for an easy way so I think I will just forget about it and go on to my next project....the wall hanging swap. ...my favorite! Apparently its from the 1930s, a Canadian Laura Wheeler designed it; she started in 1928 designing quilts. I got several hits in Google looking for quilt pattern "Wheeler". Did not find it in my Blockbase or Kansas City Star vintage patterns. Hope this helps. Brackman's book calls it "Star" and "Star of the East" -- OCS/Wheeler being sources. "I keep my end tables full of needlework and quilting so I don't have to dust them." ~ Author Unknown but I agree! QuiltingNinaSue and Evie..... I found it on Pinterest .......thanks.....Star of the East is definitely the name. Depression era block and available on eBay. I think it is available from MJ Vintage Blocks. Maybe I will have to buy it!